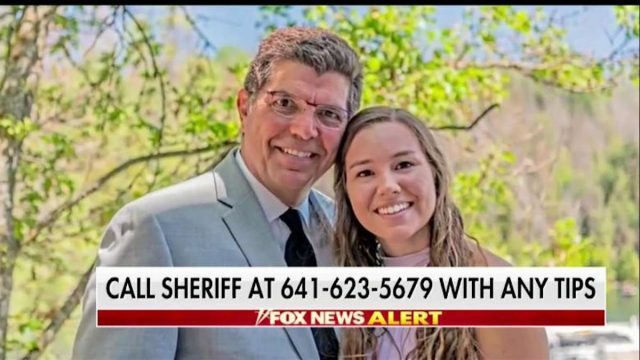 Rob Tibbetts missing Iowa student’s father theory, ‘My daughter is still alive somewhere’. Rob Tibbetts missing University of Iowa student’s father thinks freshman daughter is still alive-but what if she just ran away? Is Mollie Tibbetts with someone she knows? In a new twist regarding the developments of missing University of Iowa student, Mollie Tibbetts which has captivated the nation since disappearing after an evening jog are claims the 20 year old freshman might be camping out with someone she know. Speaking to ABC News on Monday, Rob Tibbetts opined Mollie having been taken by someone she knows. Told the father, ‘I do believe Mollie is with someone she knows, probably someone who cares about her’. Which raises the awkward question if so then why hasn’t Mollie been able to call her family to let them know she is alive? Unless of course she wasn’t abducted but simply chose to leave of her own accord? Robb Tibbetts said he thought that his 20 year old daughter’s ‘outgoing personality’ and ‘kindness’ may have given someone the wrong idea. Added the father who stressed he was only speculating, ‘I do really believe what happened to Mollie wasn’t that someone set out to harm her’. Rob Tibbetts wondering whether daughter was abducted or left on her own will? The latest developments come as investigators have been staying quiet about the details of the case and haven’t confirmed whether they believe Mollie was abducted. The rising sophomore at the University of Iowa was last seen jogging through Brooklyn, Iowa, on July 18 and was reported missing the next day when she didn’t show up to her job at a daycare center. Added the concerned father who must have run a thousand scenarios in his mind by now, ‘I think because they haven’t found Mollie, that Mollie is still someplace, and we can get her home’. Which is to wonder, but what if Mollie herself made a mistake and simply chose to leave without telling her family- and if she did leave, why would she simply pack up without a trace and force her friends and family to agonize over her wellbeing? Which is to say- why would a 20 year old student with everything to seemingly live for seek to simply vanish? But what if Mollie has now adopted the unforeseen attention on her plight as she reads through the tabloids and social media posts wondering about her whereabouts…. I don’t know if anyone else is following the Mollie Tibbetts disappearance, but I can’t get her off of my mind. There’s something extremely unsettling about the case that I can’t wrap my mind around. It’s absolutely terrifying and one of my biggest fears. Can someone hurry and find mollie tibbetts before i have to go to Iowa and find her myself??? I spend the majority of my day refreshing my internet to read about the Mollie Tibbetts case. It’s the first thing I read about every morning in hopes she’s been found. I can’t imagine what her family is going through. It breaks my heart and I don’t even know her. A scheduled press conference today about #MollieTibbetts is now rescheduled for Friday, 9:30 CT. We might finally learn new information, or they are just delaying because there’s nothing.